Con: "[John Lofton of American View]: Sure. You think abortion should be a crime? None Found: ProCon.org emailed the Gingrich campaign for his position to this question on Oct. 26, 2011, Nov. 11, 2011, and on Jan. 30, 2012. We also left a follow up telephone message on Feb. 8, 2012. We have not yet received a reply with Gingrich's position as of Feb. 13, 2012. None Found: Withdrew on May 2, 2012; no additional research done as of that date to determine candidate’s position on this question. Not Clearly Pro or Con: "Outsource the authentication of new Medicare and Medicaid suppliers to Visa, Mastercard, or American Express. After forty years of failure, it is clear the status quo in Washington, D.C., is incapable of managing these programs, so let’s turn to experts with a track record of success. The American credit card industry processes over $2 trillion in transactions every year, and there are 800 million credit cards accepted by millions of vendors to buy countless products. Yet fraud constitutes just one-tenth of one percent of the credit card industry. Conservatively speaking, fraud in Medicare and Medicaid is 10 percent, making it 100 times worse." Pro: "I was very proud as Speaker to be able to make sure that the Helms-Burton Act [a 1996 law which strengthened the US embargo against Cuba] passed, and I'm delighted that Congressman Dan Burton is here tonight and is campaigning with me, because it was a very important step towards isolating the Castro regime. Newt Gingrich: “I think if you are, for example, the leader of a cartel, sure. Look at the level of violence they've done to society. You can either be in the Ron Paul tradition and say there's nothing wrong with heroin and cocaine or you can be in the tradition that says, 'These kind of addictive drugs are terrible, they deprive you of full citizenship and they lead you to a dependency which is antithetical to being an American.' If you're serious about the latter view, then we need to think through a strategy that makes it radically less likely that we're going to have drugs in this country." Con: "[US Senate Minority Leader Mitch] McConnell's [debt ceiling increase] plan is an irresponsible surrender to big government, big deficits and continued overspending." Now Con: "First, my policy is to break up both Fannie Mae and Freddie Mac…Second, I want to state unequivocally, for every person watching tonight, I have never once changed my positions because of any kind of payment. Because I -- the truth is, I was a national figure who was doing just fine, doing a whole variety of things, including writing best-selling books, making speeches. And the fact is, I only chose to work with people whose values I shared and having people have a chance to buy a house is a value I believe still is important in America." Not Clearly Pro or Con: "And one of the things the Congress should do immediately is defund the National Labor Relations Board which has gone into South Carolina to punish Boeing, which wants to put 8,000 American jobs in South Carolina, by fundamentally eliminating right-to-work [legislation that let employees decide for themselves whether or not they want to join a union or financially support it] at the National Labor Relations Board (there are more than 22 states with right-to-work laws -- laws that do not force people to pay union dues as a condition ofemployment). That's a real, immediate threat from the Obama administration to eliminate right-to-work. And I think that it is fundamentally the wrong direction. I hope that New Hampshire does adopt right-to-work. I frankly keep it at the state level because as each new state becomes right-to-work, they send a signal to the remaining states, don't be stupid. Why you want to be at California's unemployment level when you can be Texas's employment level? Or North Dakota's? And I think... that if you believe in the 10th Amendment, we ought to -- let the states learn from each other. And the right-to-work states are creating a lot more jobs today that the heavily unionized states. The public employee union question is a totally different issue." Pro: "I think the fact is that NAFTA enabled us to build jobs in Canada, the United States, and Mexico, in competition with China. I mean, our big competitor is not Mexico. Our big competitor is China and India. And I’d rather have jobs close to the United States than have jobs overseas in places like China and India. That’s why I was in favor of it and I think on balance, look at who our biggest customers are. Our biggest customers are Canada and Mexico. They buy more American products than other countries do. So in a sense, I’d like our neighborhood to be fairly well off and fairly prosperous." Pro: "Everybody in big oil who hates ethanol will you give you this no subsidy argument, right. So Obama comes in at the beginning of this year and says 'lets get rid of $10-$14 billion dollars in oil exemptions.' Did you hear anybody jump up in the oil business and say 'Boy, that's exactly right? Hate those subsidies.' No, everybody's whose tried to kill ethanol on behalf of big oil, promptly jumped up and said -- and happens to be right by the way, and I'm against getting rid of these -- that they in fact apply overwhelmingly to the small independents who do all the exploration from the new fields… You've got two sources of energy fighting each other. I am for both of them." HR 3734 stated: "The purpose of an allotment under subsection (a) to a state is to enable the State to provide abstinence education, and at the option of the State, where appropriate, mentoring, counseling, and adult supervision to promote abstinence from sexual activity, with a focus on those groups which are most likely to bear children out-of-wedlock." Not Clearly Pro or Con: "I think that education should be the first civil right of the 21st century and I think we have to move forward from No Child Left Behind towards helping every American get ahead." Con: "I think the whole concept of a state or federal curriculum is profoundly wrong. If you bureaucratize the process, you bureaucratize the teacher, you make it all boring and it all becomes a matter of cheating. Because when you're studying for the test, you're not studying to learn, you're studying to get through some test and everybody knows it. So you gradually take life out of the system." Con: "The current ideologically driven, credentialed, bureaucratic, unionized, tenured system cannot be fixed... Tenure should be abolished. No bad teacher should be permitted to ruin a child’s future." Pursuant to this plan, we should take eight steps immediately to address these skyrocketing gas prices and jumpstart production of American energy: Approve the Keystone XL pipeline." "As a Sierra Club member, Mr. Gingrich, you opposed drilling for oil in the Arctic National Wildlife Refuge, calling it a '188-day quick fix' for America's energy future. 'Fuel efficiency and conservation measures have a greater potential for providing longterm energy security for our nation,' you said in response to a Sierra Club questionnaire. 'The dramatic increases in fuel efficiency seen in America's automotive fleet are evidence of how we can meet energy needs of the future.'" Now Not Clearly Pro or Con: "Newt does not believe there is a settled scientific conclusion about whether industrial development has dramatically contributed to a warming of the atmosphere." (4) global warming will jeopardize prospects for sustainable development and reduction of poverty, accelerate extinction of animal and plant species upon which human survival depends, and alter yield, productivity, and biological diversity of natural and managed ecosystems, particularly forests;." Pro: "In states where people have been allowed to have concealed weapons, in Mississippi and Kentucky, there have been incidents of this kind [Virginia Tech massacre] of a killer who were stopped, because in fact, people who are law-abiding people, who are rational, and people who are responsible had the ability to stop them." Con: "The big government Obamacare approach does not address the root causes of America's health care crisis. Instead, it creates layers of new taxes, regulations, and bureaucracies that will ultimately make our problems worse, not better." Not Clearly Pro or Con: "There are currently anywhere from 8 to 12 million people living in the United States who entered illegally... We need a path to legality, but not citizenship, for some of these individuals who have deep ties to America... Applicants must first pass a criminal background check, and then the local committees will assess applications based on family and community ties, and ability to support oneself via employment without the assistance of Social Security, Medicare, Medicaid, and other entitlement programs... The government will rigorously enforce a requirement that all individuals seeking this path to legality must be able to prove that they can independently pay for private health insurance. If an individual cannot prove this, they will lose the ability to stay in the United States... Moving forward, those who receive this status will have to prove on a regular basis that they can support themselves without entitlement programs and pay for health insurance or else risk the ability to stay in the United States." Con: "There is no possibility that the federal government could run such a [guest worker] program without massive fraud and counterfeiting. On the other hand, American Express’s rate of fraud is less than one tenth of one percent. We can build on the universal system of biometric, tamper-proof visa documents that all visitors must have, and invite a private-sector firm with a proven track record to monitor the guest worker program. For guest workers, the new tamper-proof, biometric cards will replace the e-verify system, which has some promising elements, but is too error-prone. Employers will be able to swipe prospective employees biometric cards, and immediately be able to confirm that these workers are in the country legally." Pro: "Bill O'Reilly: All right, let's go to immigration. Border fence, would you put a border fence from Brownsville [border city in Texas] San Diego if you were president? Pro: "If we get to a point where the military believes that they [Iran] are truly on the verge of getting a nuclear weapon, I would be prepared to use military force." Pro: "We have blocked further attacks on America largely because of the courage and determination of one man, President George W. Bush. As I wrote in October 2004, faced with the deliberate and horrific attacks on 9/11, President Bush instinctively understood that this was a war. He demonstrated his courage by taking that war to al Qaeda to protect the American people. Despite opposition from confused and reluctant bureaucrats and politicians, he acted. That decision was the decisive break with the terrorism-as-a-criminal-act strategy and in direct contrast to the terrorism-as-a-nuisance mindset held by many. Pro: "[T]he US government should actively support a democratic Palestinian state... The US government can play a constructive role by stating the circumstances under which it would recognize a Palestinian state and establish an embassy. President George W. Bush has already taken key steps in this direction, outlining the conditions for recognizing a Palestinian state in a June 24, 2002 speech... [T]he United States should begin to take clear steps to bring a better life for the Palestinian people and should propose better systems and solutions to ease the daily depravations of the Palestinian people." Con: "I believe that marriage is between a man and woman. It has been for all of recorded history and I think this [gay marriage] is a temporary aberration that will dissipate. I think that it is just fundamentally goes against everything we know." Con: "I will be totally candid. I've had a life which, on occasion, has had problems. I believe in a forgiving God, and the American people will have to decide whether that's their primary concern. If the primary concern of the American people is my past, my candidacy would be irrelevant. If the primary concern of the American people is the future, they have to decide who can effectively get us to a future in which we are economically prosperous, militarily safe, and will maximize freedom for the American people. And that’s a debate I’ll be happy to have with your candidate or any other candidate..."
Not Clearly Pro or Con: Chris Moody: "Would you continue the current federal policy making marijuana illegal in all cases or give the states more control?" Gingrich: "I would continue current federal policy, largely because of the confusing signal that steps towards legalization sends to harder drugs. I think the California experience is that medical marijuana becomes a joke. It becomes marijuana for any use. You find local doctors who will prescribe it for anybody that walks in." Chris Moody: "Why shouldn't the states have control over this? Why should this be a federal issue?" Gingrich: "Because I think you guarantee that people will cross state lines if it becomes a state-by-state exemption. Now Con: "There is no medical marijuana. Marijuana is a drug. There is nothing in the Food and Drug Administration that supports the idea that it's medical. There's nothing in the Institute of Medicine that supports the idea it's medical. The American Medical Association has not said it's medical. This is a clever ad for a terrible idea. And the fact is it is a drug, it is currently illegal, it should remain illegal, that’s better for our children, and it’s better for Florida, and it’s better for America." "We believe licensed physicians are competent to employ marijuana, and patients have a right to obtain marijuana legally, under medical supervision, from a regulated source. The medical prohibition does not prevent seriously ill patients from employing marijuana; it simply deprives them of medical supervision and denies them access to a regulated medical substance. Physicians are often forced to choose between their ethical responsibilities to the patient and their legal liabilities to federal bureaucrats. Representative McKinney and I hope the Council will take a close and careful look at this issue. Federal policies do not reflect a factual or balanced assessment of marijuana's use as a medicant. The Council, by thoroughly investigating the available materials, might well discover that its own assessment of marijuana's therapeutic value has, in the past, been more than slightly shaded by federal policies that are less than neutral." Con: "I am totally, unequivocally opposed to national service. It is coerced volunteerism.... It's gimmickry." Con: "All of the Occupy movement starts with the premise that we all owe them everything. They take over a public park they didn't pay for, to go near by to use bathrooms they didn’t pay for, to beg for food from places they they don’t want to pay for, to obstruct those that are going to work to pay the taxes to sustain the bathrooms and to sustain the park so that they can self-righteously explain that they are the paragons of virtue to which we owe everything. Now, that is a pretty good symptom of how much the left has collapsed as a moral system in this country and why you need to reassert something as simple as saying to them, 'Go get a job right after you take a bath.'" Con: "I believe evolution should be taught as science, and intelligent design should be taught as philosophy." Pro: "[E]verybody who's older and wants to be totally protected, fine. No change. So don't let anybody lie to you, starting with the president. No change. But if you're younger and you'd like a personal account you would control instead of the politicians....and you know you'll have more money at the end of your lifetime if you control it than the politicians, why shouldn't you have the right to choose?" Pro: "KING: Mr. Speaker, if you look at a poll in the Boston Globe just the other day, 54 percent of Republican voters in this state say they're willing to have higher taxes on the wealthy to help bring down the deficit. Are they wrong? 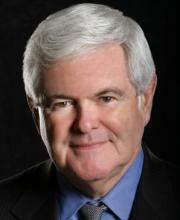 GINGRICH: Well, the question is, would it, in fact, increase jobs or kill jobs? The Reagan recovery, which I participated in passing, in seven years created for this current economy the equivalent of 25 million new jobs, raised federal revenue by $800 billion a year in terms of the current economy, and clearly it worked. It's a historic fact. The Obama administration is an anti-jobs, anti-business, anti- American energy destructive force. And we shouldn't talk about what we do in 2013. The Congress this year, this next week ought to repeal the Dodd-Frank bill, they ought to repeal the Sarbanes-Oxley bill, they ought to start creating jobs right now, because for those 14 million Americans, this is a depression now." Con: "Stop the 2013 tax increases to promote stability in the economy. Job creation improved after Congress extended tax relief for two years in December. We should make the rates permanent. Make the United States the most desirable location for new business investment through a bold series of tax cuts, including: Eliminating the capital gains tax to make American entrepreneurs more competitive against those in other countries; Dramatically reducing the corporate income tax(among highest in the world) to 12.5%; Allowing for 100% expensing of new equipment to spur innovation and American manufacturing; Ending the death tax permanently." Con: “It's tragic that President Obama cannot learn that class warfare and bureaucratic socialism kill jobs… On tax policy, you ought to say no tax increase in 2013, period. Go to zero capitals gains so hundreds of billions of dollars pour into the country to be invested. Go to a 12.5 percent with corporate tax rate… you ought to abolish the death tax permanently, because it is an immoral tax which says, if you work, save and do the right thing your entire lifetime, politicians have the right to take your money. Pro: "First of all, I think the Republican Tea Party will beat the Democratic Socialist Party... Second, I like the Tea Party movement... I think the Tea Partiers I meet with around the country... are serious people studying the Constitution, trying to find a way to get back to balanced, limited government with balanced budgets and with much less power in Washington, and I approve of their general direction." Pro: "Well, I favor a Constitutional amendment to protect the traditional family and I think we should have such an amendment." Not Clearly Pro or Con: "Van Susteren: All right, now, waterboarding -- is that torture? Con: "Nazis don't have the right to put up a sign next to the Holocaust museum in Washington... [W]e would never accept the Japanese putting up a site next to Pearl Harbor. There is no reason for us to accept a mosque next to the World Trade Center."